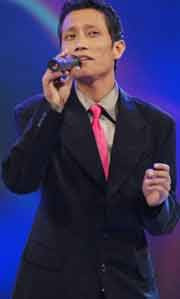 This is going to be a critical week for former "Indian Idol" Prashant Tamang. He is now aiming to become the new matinee idol of Nepal, the country that helped him win the popular Indian reality show three years ago. Though the film on a poor boy from the hills who joins the British Army to escape poverty was released Friday, the actual commercial run started Tuesday because the festivities kept the viewers away and the absence of newspapers meant no critical reviews of the movie. Directed by Nepali singer Narayan Rayamajhi, "Gorkha Paltan" brought two unexpected visitors in Kathmandu to promote the film. One of them is Prashant himself, who reportedly cut short a concert in the US to attend the premiere. The other is his mascot, who had boosted his morale in 2007 when he participated in the music reality show on Sony Television in India. Prashant's mother Rupa Tamang, who had crowned him with a traditional Nepali cap during the "Indian Idol" grand finale in 2007, flew in from Darjeeling to wish her son luck once again. "My son is now transforming into an actor from a singer," the proud mother told Kantipur daily. "I have come to give him my blessings. Let this journey of his too be crowned with success." As mother and son watched the film at the Ashtaranayan multiplex in Kathmandu's busy industrial area Balaju, an overcome Rupa wept during the screening. At the end of the film, she said it was the story of her son, indeed, of their entire family. Prashant's father, who was with Kolkata Police, died when his son was still a teenager. The tragedy forced the teen to leave school and step into his father's shoes to look after his mother and sister. Though Prashant has two more films in the pipeline - "Angalo yo mayako" and "Kino mayama" - to buck up his career, "Gorkha Paltan" will play a decisive role in making or marring his new avatar. The media has already started comparing him to other singers who also tried their hands at acting, but returned to singing. Nepal's best-known example is golden-voiced singer Udit Narayan Jha, from the Terai plains, who despite his acclaimed role in the blockbuster Nepali film "Kusume Rumal", failed to carve a niche for himself as an actor in the Hindi film industry. Though Bollywood rejected him as a hero, it opened its arms wide to him as a playback singer. Indian singer Sonu Nigam too made an attempt to become a hero. His debut film "Love in Nepal" had a Nepal connexion as it was shot partly in the Himalayan republic and also starred the 1997 Miss Nepal, Jharana Bajracharya. Sonu too failed as an actor and returned to his first love, singing. Prashant's other two films are being shot in India.